Provide comfort for the family of Angela Teliha with a meaningful gesture of sympathy. Orangeburg -- Mrs. Angela Marie Smith Teliha, 47, of 158 Darlene Dr., passed away on January 20, 2019, tragically, in an automobile accident. Born in Gaffney, she was the wife of Steven "Scott" Teliha and the daughter of Jackie and Judy Crocker, of Gaffney. Angela worked as a LPN and loved the show Dukes of Hazard. In addition to her husband and parents, Mrs. Teliha is survived by three daughters, Amber Green, Heather Green, and Jilea Acrey, all of Gaffney; one step-son, Dillon Teliha and fiance, Kateline Curtis, of Orangeburg; three grandchildren, Bella Green, Elaina Keener, and Octavia Teliha; one brother, Joel Smith, of Blacksburg; and one sister, Summer Hughey, of Gaffney. A memorial service will he held on Sunday, February 3rd, 2019, at 3:00pm in the Gordon Mortuary of Gaffney Chapel. The Gaffney location of Gordon Mortuary is serving the Teliha family. 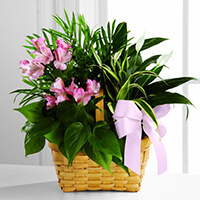 To send flowers to the family of Angela Marie Smith Teliha (Smith), please visit our Heartfelt Sympathies Store. We encourage you to share any memorable photos or stories about Angela. All tributes placed on and purchased through this memorial website will remain on in perpetuity for generations. Jay Hamby sent flowers to the family of Angela Marie Smith Teliha (Smith). Deepest sympathy and prayers from all of us at Polar. Jay Hamby purchased the The FTD Living Spirit Dishgarden for the family of Angela Teliha. To the family and friends of our beloved Angie we love and miss her here at Calhoun Convalescent Center she was a awesome nurse I didn't know of anyone who loved the Dukes of Hazzard more than this woman she was one of a kind and will be missed by everyone including her patients and the EWG gone but never will be forgotten love u baby girl rest on!!!!! Gone from our sight, but never from our hearts. Angela “Angie” was truly a funny,extravagant, caring nurse even if she talked trash. My day at work couldn’t have been better knowing that I was gonna be in her presence all day. God picks all of his blooming flowers first and I believe our Angie is growing in his garden now.